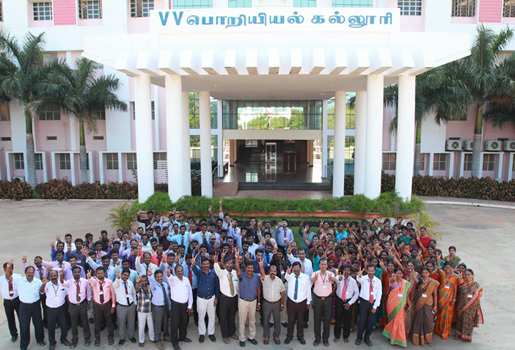 V V College of Engineering has an ample campus located in Tisaiyanvilai ,Tirunelveli (Dist. ), Tamil Nadu. VVCOE is out standing in providing their students with exceptional facilities inside the campus that has got the capacity to meet our international standards. We provide great opportunities for all our VVCians to come out as a successful professionals and pioneers in their respective specialization. Ragging is totally prohibited in VV College of Engineering inside and outside the campus. Anyone found guilty of ragging and abetting ragging whether actively or passively or being a part of conspiracy to promote, ragging is liable to be punished in accordance with UGC Regulations 2009 as well as under the provisions of any penal law for the time-being in force. Youth represent a substantial part of the membership of Red Cross for its humanitarian commitment. Young volunteers can make a significant contribution to meet the needs of the most vulnerable people within their local communities through Youth Red Cross programme. This has been designed to involve young people as much as possible in the movement and its activities not only as workers. Red Ribbon Club is a movement started by the Government of India in schools and colleges through which, students will spread awareness over HIV / AIDS. It envisages to instil charity mind among all the students to extend their able help towards developing healthy life styles, donating blood to all the needy by promotion of Regular voluntary blood donation.The red ribbon is a symbol for both drug prevention. National Service Scheme popularly known as NSS, the scheme was launched in Mahatma Gandhi Centenary year 1969 and aimed at developing student’s personality through community service. The overall objective of National Service is educational. This objective is attained through the service to the community.National Service Scheme (NSS) is a permanent Youth Programme. A Quality Improvement Cell has been constituted for the students to promote self- learning and to learn beyond the syllabus.A Quality Improvement Cell has been constituted for the students to promote self- learning and to learn beyond the syllabus.A Quality Improvement Cell has been constituted for the students to promote self- learning and to learn beyond the syllabus. The College has a Students Grievance Redressal Cell. (In order to ensure transparency, in admissions and with paramount objective of preventing unfair practices and to provide a mechanism to innocent students for redressal of their grievances. In exercise of the power conferred under clause 1 of section 23 of the All India Council for Technical education, Act 1987). The functions of the cell are to look into the complaints lodged by any student, and judge its merit. The Grievance Redressal cell is also empowered to look into matters of harassment.Anyone with a genuine grievance may approach the department members in person, or in consultation with the officer in-charge Students Grievance Redressal Cell. In case the person is unwilling to appear in self, Grievances may also be sent through e-mail to the officer in-charge of Students Grievance Redressal Cell. Proper dress code should be followed.Body fit clothing, transparent or revealing outfits should be avoided.Salwar kameez with duppatta is advisable for girls.Torn, faded jeans and T-shirts are not allowed for boys. Girl Students should refrain from using shortcuts to reach their places.Sharing of mobile phone numbers with the unknown persons should be avoided. Harassment of any nature should be reported to the higher authorities for redressal.Sexual harassment involves unwelcome words, deeds, symbols, actions, gestures that makes the target uncomfortable.Sexual assault or sexual harassment or sexual misconduct is an offence and viable for criminal proceedings.The 24 hour helpline and help desk made available for the students can be utilized for reporting any untoward incidents which cause physical / mental anguish. Helpline no. 04637 - 273213. The Students Branch of Computer Society of India (CSI) was inaugurated in VV College of Engineering, Tisaiyanvilai, on 06-08-2013. The function was organized by CSE Department. Mrs. I. MuthuLakshmi, Head of the Department, CSE welcomed the gathering. Dr.P.Melba Mary, Principal, VV College of Engineering presided over the function and delivered the presidential address. Mr.Y.Kathiresan, Senior Manager(Promotions) CSI-Educational Directorate, Chennai was the Chief Guest of this function. In his key note address he explained about various activities of CSI and the benefits of becoming a member of CSI. Ms.G.Gifta Jerith delivered the vote of thanks. Director(Admin) Dr.I. Sundarapandi graced the occasion by his presence. The Heads and faculty members of various departments and the students of Computer Science and engineering department participated in this function.